In an effort to check terrorism and to secure the country’s vast coastal belt the Cabinet Committee on Security (CCS) today approved a Rs 742 crore scheme which was apparently part of the recommendations by the Group of Ministers (GoM). The approved plan would strengthen maritime security by enhancing patrolling and surveillance in the coastal areas. 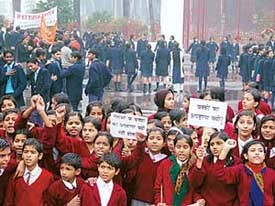 Braving the early morning showers, hundreds of schoolchildren today demonstrated in front of Raj Bhavan here seeking Governor Buta Singh’s intervention for the safe release of three fellow pupils kidnapped from different parts of Bihar. The Supreme Court today admitted an appeal of Chandigarh District and Sessions Judge H S Bhalla, challenging an order of the Punjab and Haryana High Court, impleading him as a party in a public interest litigation (PIL) on the Burail jail break issue. Every citizen is living under fear and terror of Chautala, Ajay and Abhay. The Portugal Supreme Court has allowed extradition of the 1993 Mumbai bomb serial blasts accused Abu Salem to India. India has once again decided to take up the issue of Iran-India gas pipeline through Pakistan at the upcoming South Asian Association for Regional Cooperation (SAARC) meeting, scheduled to be held at Dhaka next month.